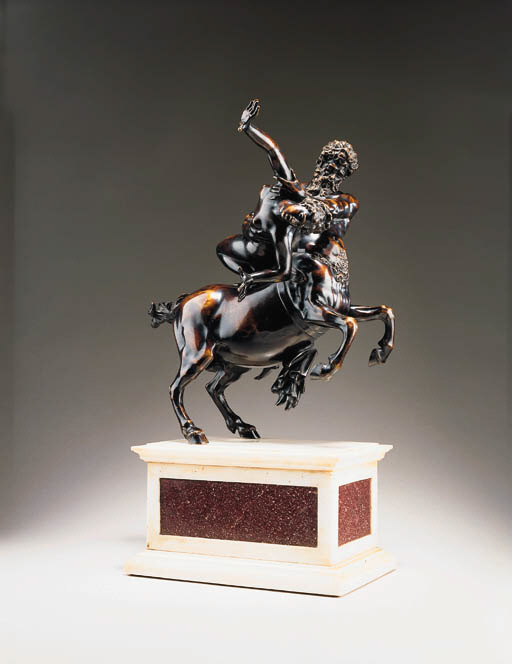 Giambologna designed three principal variations of bronze statuettes depicting the theme of the centaur Nessus carrying off Deianira, the wife of Hercules. The present model was conceived by Giambologna is the autumn of 1575 for his patrons the Salviati family. It conforms to his Type B which represents Deianira is a horizontal attitude and shows Nessus looking down at her. Judging from the fine chasing and rich reddish color, it appears to be French rather than Italian, and to date from the early eighteenth century. Examples of this type are found in the Wallace Collection, London and the E. Huntington Art Gallery, San Marino, CA.